The University of Northern Iowa student section, Panther Mayhem, would like your help in fundraising for new flags to improve the student experience at various UNI gameday events! Across the nation, different sized flags can be seen in many capacities on game days to help boost school spirit. Panther Mayhem is raising money to purchase new U-N-I flags due to wear and tear on the current flags. Alongside new U-N-I flags, we would like to add P-A-N-T-H-E-R flags to the gameday experience. These flags will provide the opportunity for us to showcase who we are and our UNI pride before games begin and during other events, such as touchdowns and parades. In addition to the new letter flags, Panther Mayhem is looking to buy a new item called a TIFO flag. A TIFO flag is a giant banner that will be 34 feet by 38 feet and cover a portion of the student section. When this flag is showcased, a large number of students will be able to participate. This TIFO flag will be a tool to draw students to UNI games and encourage participation of all students in the student section as we cheer on the Panther teams to victories. Panther Mayhem appreciates your support in any capacity. Your generous donation will go towards U-N-I flags, P-A-N-T-H-E-R flags, and a TIFO student section flag. We would like to thank you in advance for your support and GO PANTHERS! To discover what Panther Mayhem is all about, check out our Facebook or Twitter pages today! 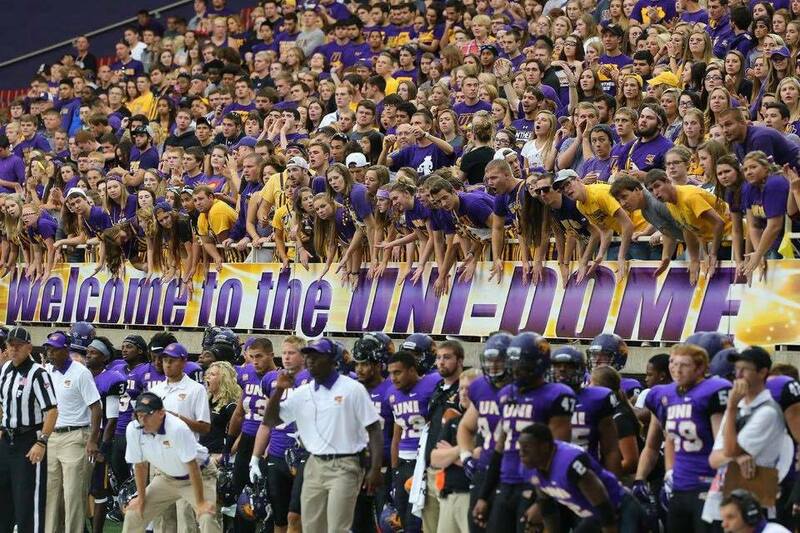 By supporting this project, you can help UNI students show their Panther pride before games begin, and you can receive a cheery smile from a Panther Mayhem Member. Your contribution to the project will help students use their Panther pride to create ‘Mayhem’ during sporting events, and you can receive a thumbs up from a Panther Mayhem Member. At this level, you can help UNI students show their Panther pride when we wear our bib overalls during the games, and you can receive a high-five from a Panther Mayhem Member. Through your support, UNI students will be able to have a better opportunity to get involved on gameday, and you can receive a cheery smile and a thumbs up from a Panther Mayhem Member. At the purple level, you can help UNI students and everyone show off their best Panther Purple when we have a purple out game, and you can receive a cheery smile and a high-five from a Panther Mayhem Member. By giving gold, you will support UNI students achieve the highest possible noise level at athletic events, and you can receive not only a cheery smile, but also a thumbs up, a high five, and the best gameday you have ever experienced.